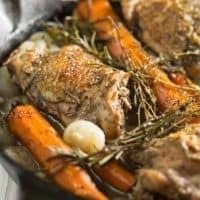 Grab a plate and a fork, cause you’re going to want to dig in to this tea braised chicken thighs dinner! I see many delicious Sunday suppers in your future. This post is sponsored by Teabox. I finally pulled out my cast iron skillet and now all I want to do is braise meat and make large dinners. I rarely want to braise in the summer but once the weather gets colder, I am all about it. The low, slow cooking method always fills my kitchen with the most delicious smells and I will all of a sudden get extremely hungry. That’s always a good sign, right? Tea braised chicken thighs take that amazing smell to the next level. The Himalayan Shrangi La Spring Oolong tea from Teabox is perfect for this recipe. Oolong tea, in general, has a smooth flavor and is a little earthy; the Himalayan Shrangi La Spring Oolong has a mellow earthiness that fades to reveal flavors both sweet and sharp. I think the carrots and cippilonie onions in this dish compliment that flavor profile very well. First things first, you need to steep your tea. All of the Teabox bags give you steeping instructions, as well as a variety of information about the tea blend itself (region, caffiene level, add-ons etc). I used to throw a teabag in a cup of hot water and just roll with it. Big mistake. I found that following the steeping instructions leads to a much more enjoyable cup of tea. After your tea is steeped, let it cool and trim your chicken thighs. Heat up a skillet and some oil and place the chicken thighs in the pan, skin side down. Let that crisp up, then flip the thighs and cook them again. When that side gets crispy, remove the chicken from the pan and set it aside. Don’t worry, we will come back to it shortly. Add a little butter to your pan, scraping up any chicken pieces that may have stuck to the pan. Add your garlic and saute it for a minute before adding your cooled tea to the pan. Let this mixture come to a rolling boil, then add your chicken, carrots and onions to the pan. 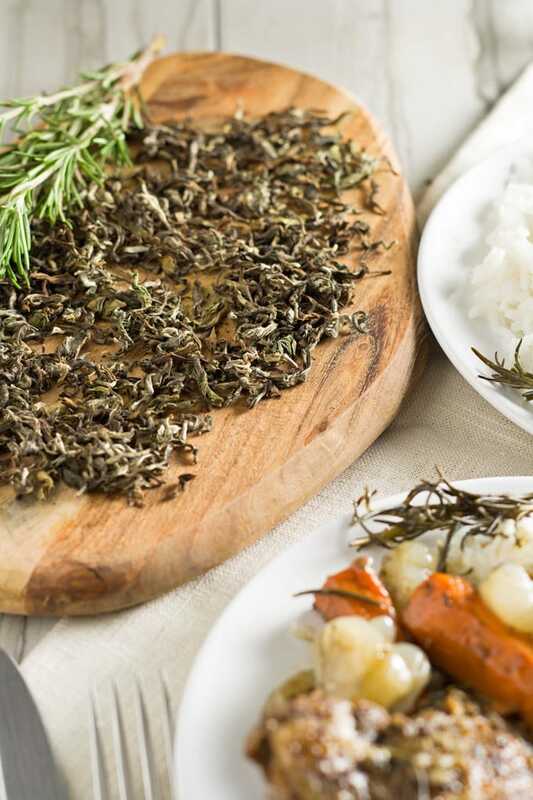 Place some rosemary and thyme sprigs over the chicken, season your veggies, cover and wait. Well, don’t actually wait. Walk around, maybe make a salad, maybe do a load of laundry. Then, when your timer goes off, flip the chicken again. This time, make some rice to go with the braised chicken. When the timer goes off for the second time, you are going to have perfectly cooked, tea braised chicken thighs. 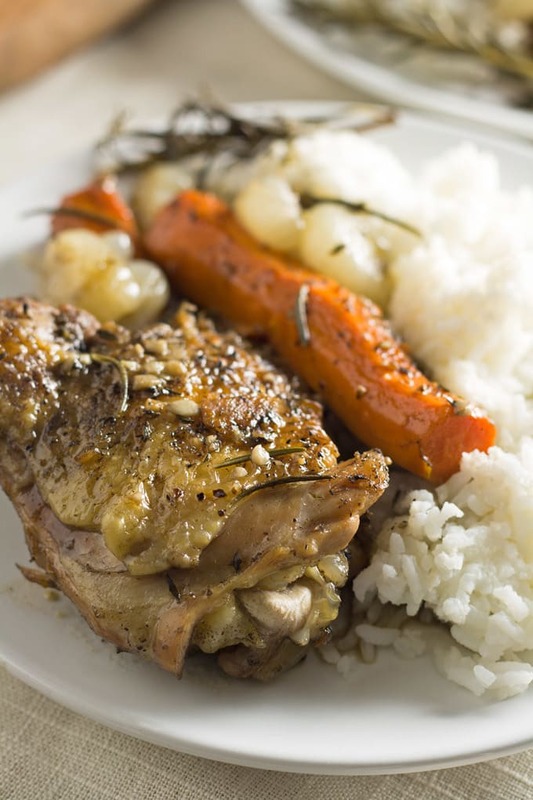 Grab a plate and a fork, cause you're going to want to dig in to this tea braised chicken thighs dinner! I see many delicious Sunday suppers in your future. Heat a skillet over medium high heat and add the olive oil. Season the chicken thighs with the salt and pepper on both sides. When the oil is hot, place the chicken thighs in the pan, skin side down and sear until golden brown, 3-4 minutes. Flip the thighs and sear the other side until golden brown, another 3-4 minutes. Remove the chicken from the pan and set aside. Add the butter to your pan, scraping up any chicken pieces that may have stuck to the pan. Add your garlic and saute it for a minute, then add the flour and stir well to create a roux. Add the Oolong tea to this mixture and let it come to a rolling boil, then add your chicken, skin side down, carrots and onions to the pan. Sprinkle some salt and pepper on the vegetables, then place the rosemary and thyme sprigs over the chicken. Reduce heat to medium low. Cover the pan and let cook for 30 minutes. Then remove the cover, flip the chicken and cook for an additional 30 minutes. Serve with rice. Would you like to try Teabox? Use this coupon for 50% off your first subscription box – coupon code is BGSUB50. Thanks to Teabox for allowing me to partner with them to come up with this fun and delicious recipe! I’ve never made tea braised chicken. This is gorgeous! I can’t wait to try it! Thanks Anna – I hope you enjoy it! This looks like pure comfort food to me Jenny! Delish! I love the sound of this, and would be down to put that on my menu!! 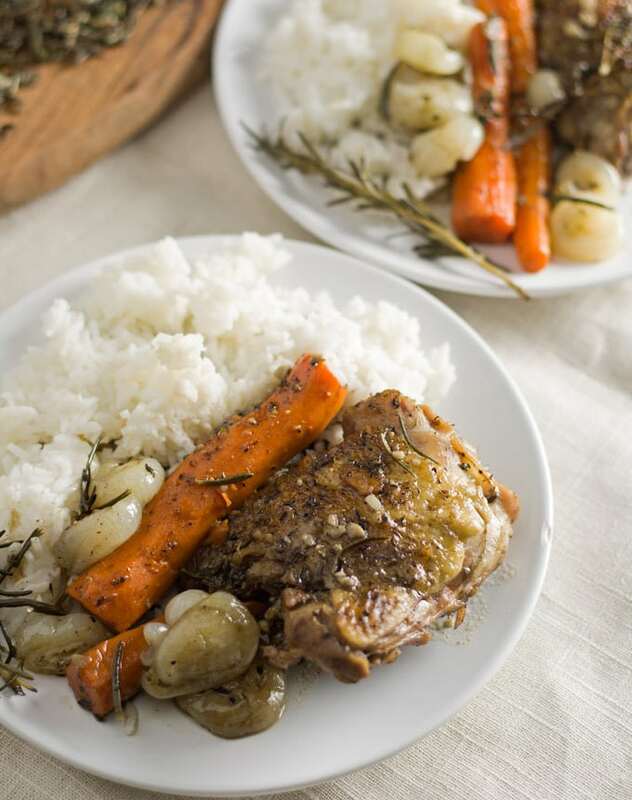 This looks so delicious and I love that it’s braised with tea, so aromatic and flavorful! 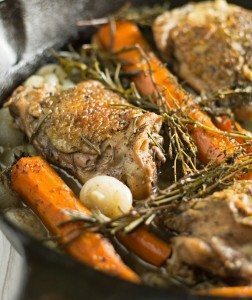 I love braising, it always leads to such tender and flavorful meat! This chicken looks incredible! Such great comfort food! This is just lovely! Looks like it tastes amazing! I love my nightly cup of tea – but I never thought about adding tea to my chicken!! Lovely! Jenny, I DO want to grab a fork and dig into that! Wonderful! My husband doesn’t like chicken thighs (but he can just lump it, right?!). 😀 I could throw in a chicken breast for him, I suppose. I LOVE using sweet tea to braise pork. Totally want to try this! I love using chicken thighs because they are cheaper and have more flavor. I have to buy the boneless ones for the kids, even though they are not as flavorful, but they won’t eat it with the bones. I can’t wait to try this with the tea! I have been going to teavana and spending way too much money so maybe I can use some of my tea for this! I think you’ll love it Jennifer! This sounds interesting and yummy! Thank you for sharing with us @ #HomeMattersParty. We would love to have you again next week.